Dikrt s. r. o. was founded in 1992. Dikrt s.r.o. is involved in anticorrosive improvements of parts used in chemical, petrochemical, pharmaceutical and food industries, made by lining of tubes, pipes, valves, hoppers, fittngs, vessels with PTFE, PFA,FEP, E-CTFE, PVDF. We produce inductive flowmeter-sensors. Another field of our activities are consultations and deliveries of fluorpolymeres. 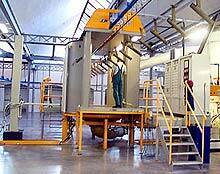 We have two powder coating plants. In July 2012, the reconstruction of the entire company premises Dikrt, spol. s ro in Svatava and was expanded storage and production capacities, including spaces.